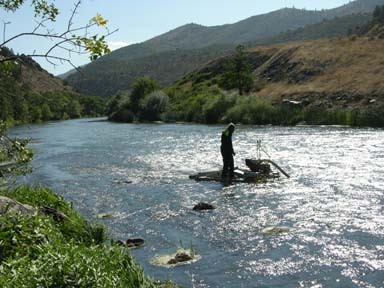 » Gold on the Upper Klamath!! 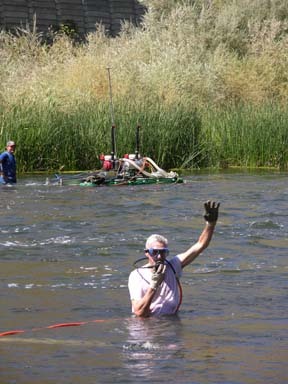 We just completed this season’s third special Group Dredging Project along the Klamath River. 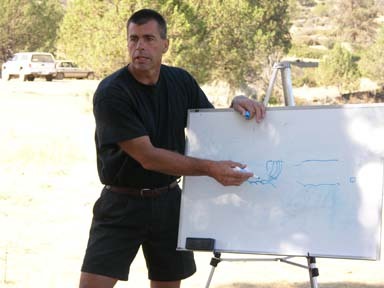 It took place on the Club’s new Upper Klamath properties, near UK-3. 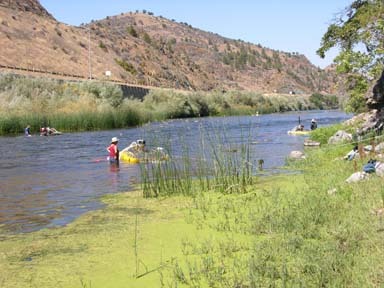 These properties are located near where Highway 96 meets Interstate 5, around 65 miles upriver from Happy Camp. There were 15 participants in all (12 men and 3 women), including several experienced helpers, Craig Colt, Jake Urban, Lily Fuller, Ken Eddy and myself. Three of the participants were dredging for the first time ever, and several others only had a little previous experience. One of the primary objectives of these Projects is to help all participants achieve personal confidence while dredging underwater. Lily Fuller, Jake Urban and I take this responsibility very serious. Under our careful guidance, all beginners on this Project were doing very well underwater by mid-way through the week. Nearly all of us camped in the Club’s long-term Klamathon campground for the duration of the Project. 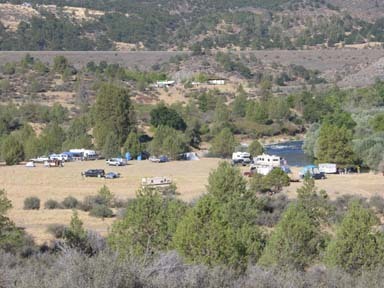 Camp-Klamathon is a large, scenic camping area (free to members) which extends along the Klamath River within about 2 miles of the UK claims. This is a popular camping area for members who are mining in the area. As other members were also camping and mining in the area, we spent some of the after-hours visiting and enjoying our time together during this adventure. Club member, Ernie Kroo, showed up about midway through the week to resume one of his traditional rolls as the Camp Barbeque-Master. The food was great! 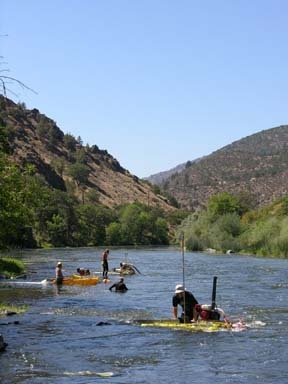 The Club has access to well over 60 miles of mining claims to choose from along the Klamath River and its tributaries when organizing these Group Projects. The options are almost unlimited with this much waterway to choose from. Choosing a productive location is one of the most important first steps. 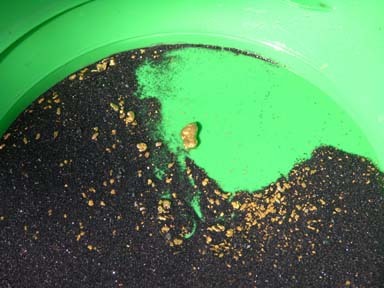 This is because once we launch a Group Project into an area, there is not enough time to withdraw and begin the sampling process somewhere else, and still expect to recover very much gold by the end of the week. So we always choose our location very carefully. However, making the decision where to go on this particular Project was not difficult. Because so many other members have done very well on the new UK properties this season, and because Craig and Ernie already had a 6-inch dredge working in high-grade gold that we discovered during the July Dredging Project on UK-3, we decided it would be wise to do this Project on the UK claims. 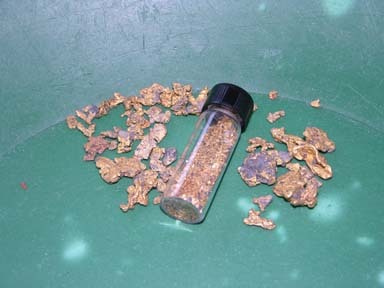 There was already an ongoing gold rush taking place on UK-3 when we arrived there last week. 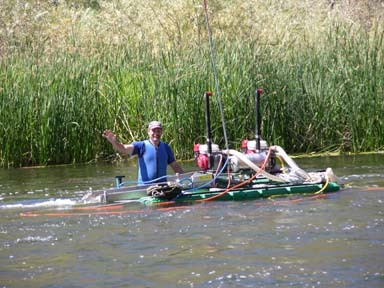 So we decided to direct our sampling effort further down river on UK-2. There was only one other member (Mark Johnson) dredging when we arrived at UK-2. He was dredging out near the middle of the river near the top-end of UK-2. Mark was kind enough to show us some of the gold he was accumulating in two separate bottles. The bigger bottle enclosed some very nice nuggets. Wow!! Seeing those nuggets got us really fired up. So we doubled our efforts to get our own dredges into the water and position them on both sides of the river downstream from where Mark was dredging. 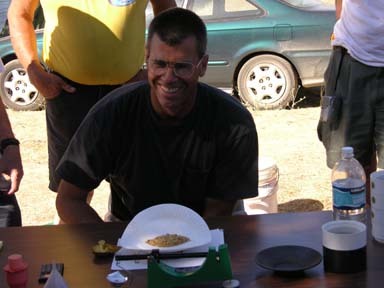 Other members were already recovering high-grade gold even before we began this project! 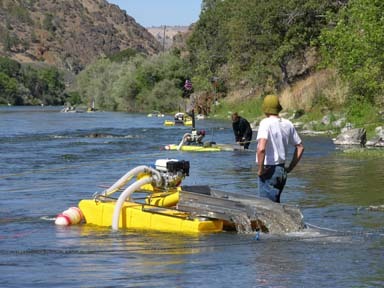 Having some beginner-dredgers on a Group Project requires a place where there are some easily-accessible, slower, shallow-water areas; comfortable places where we can get people started, and there is still hope of finding high-grade gold. 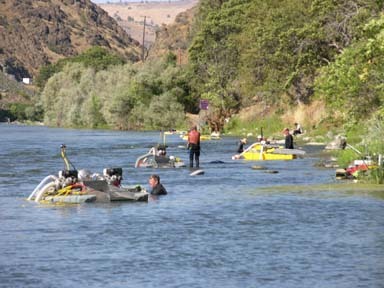 There was a perfect place to set up two 4-inch dredges about a hundred yards down from where Mark was dredging. Because the river narrowed slightly down there, it appeared that we could place our less-experienced participants in slow-moving, shallow water in line with the high-grade path of gold that Mark was following upstream from us. The prospect of this made me really happy. Because picking gold nuggets off the bedrock goes a long way to help beginners get motivated and into the spirit of things! Finding one or more rich gold deposits is one of the primary objectives that we must accomplish during these week-long Projects. And we must accomplish this relatively early in the week, or chances are that we won’t have very much gold to split off at the end of the week. Already having a 6-inch dredge in a high-grade deposit up on UK-3 took a lot of pressure off me this time around. Even so, the whole group was eager to find new high-grade deposits during our time on UK-2. Craig and two of our most-experienced participants operated the 6-inch dredge up in the pre-established pay-streak on UK-3 for the entire week. This started building up our gold reserves from the beginning of the week. It was nice to see the gold building up even on the first day! Ken and two of our other experienced participants set up a 5-inch dredge just below a small natural riffle in the river on UK-2. Their plan was to push out under some swifter-moving water to see if they could find some high-grade out there – which they immediately found on their first dive. With luck smiling upon us, they established a high-grade deposit right on top of the first layer of hard-packed streambed, about 4-inches from the surface. 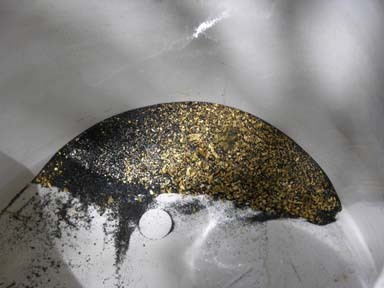 They were recovering lots of fine gold and some big-sized flakes. The water was fast, but the gold was easy; because it was being recovered right on the surface of the streambed. 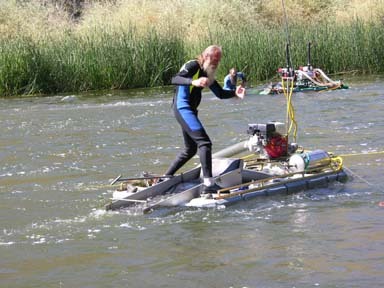 We began getting good dredge sample results within the first hour of the Project! 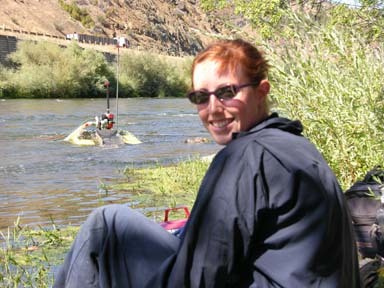 I devoted the first few days working with Jake, Lily and the less-experienced participants on the two 4-inch dredges. That part of the program was going well, with everyone quickly adjusting to being underwater. So well, in fact, that I upgraded one of the 4-inch dredges to “intermediate status” on the second day. They then began sampling further out into the river – where they immediately started recovering high-grade gold and some very nice nuggets. By the end of the second day, this 4-inch dredge looked to be recovering about as much gold as Craig’s 6-inch dredge was getting upriver! There was a lot of excitement over the nuggets being recovered. day, we all knew it was going to be a great week! By the end of the third day, our remaining three people on the beginner-team were managing the second 4-inch dredge all by themselves, and had launched into sampling. Returning from one of the other dredges, I found the beginner-team repositioning the 4-inch dredge “because there was no hard-pack” in the place they had been operating it, and they were not getting very much gold. It made me proud to discover that they had taken matters into their own hands, and were implementing good solutions. The solution in this case, meaning that they had to ease themselves out into slightly faster, deeper water that was further from the safety of the stream bank. As they eased themselves out there, they found gray hard-pack on their own, and started recovering high-grade gold, along with some nice nuggets. Boy did that make them happy! This situation prompted me to upgrade them all to “intermediate status.” We didn’t have any more beginners on this Project! As we had several dredges into high-grade gold almost from the beginning, after some group discussion on the matter, we elected to devote a second 5-inch dredge with three of our intermediate participants into dropping back towards the lower end of UK-2. Their mission was to do a sample hole in a location where we have heard rumors that there exists a rich nugget pay-streak in a deeper gravel deposit. As the gravel really was deeper down there, after devoting several days to the effort, and not being able to get a good sample of the underlying hard-pack, we decided to back off and leave that prospect for another day with a larger dredge. So, about mid-week, we pulled the second 5-inch dredge back upriver and put in line, just downstream from where the two 4-inch dredges were already recovering high-grade gold. After just a little sampling around, this dredge also located high-grade, and began recovering some of the largest nuggets we found all week. By mid-week, most of the dredges involved with the project were recovering nuggets! Meanwhile, Ken’s team on the other side of the river decided to dredge a hole down through the hard-pack to see if they could find bottom. They found it at a depth of around four feet in the gray-pack. 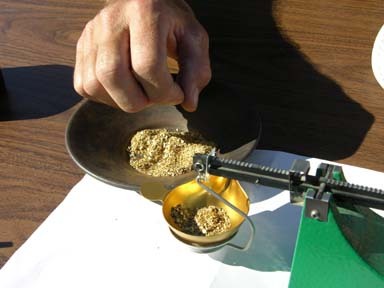 With even more luck on our side, through some trial and error, they discovered that in addition to the surface gold deposit, the gray layer of hard-pack was also paying consistently in fine gold and flakes throughout the material. Then they found the largest nugget of the week on the fourth day. So they devoted the remainder of the week production-dredging to the bottom. There is clearly an evolution happening in these organized Group Dredging Projects. They are getting better. The nature of the Projects brings the whole group together in a team-building experience. With five dredges working in high-grade gold by about mid-week, we really had some great team-chemistry going. Maybe the best I have ever seen. Also, it appears to me that we are attracting more experienced miners to the Projects. This increased experience helps focus the Projects in a more productive direction. During these Group Projects, we all meet at camp every morning to review theory concerning the various tasks that we are performing in the field; subjects like how to move and tie off dredges in different circumstances, how to avoid and cope with plug-ups (when rocks obstruct the flow of material through a dredge system), what to look for in prospecting, how to increase the volume of production, standard operating procedures in teamwork situations; all of the important things people need to know to improve their skills in this field. Mornings are a good time, where we share our experiences, and everyone can get their questions answered. During the morning sessions, we also discuss the progress we have made and make plans for how we will reach the next objective. Objectives can change on these Projects every day. First, we just want to find some gold. Then we want to find something better. Then we want all the dredges to be producing in gold. Ultimately, we evolve into a production-mode with the purpose of recovering as much gold as we can during the time remaining in the Project. We take it a step at a time, progressing towards where we need to be at the end of the week – which is having plenty of gold to split off. 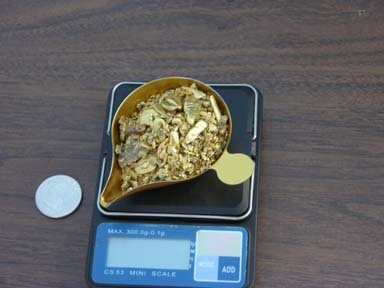 In all, we recovered nearly 7 1/2 ounces of gold for the week, of which 30.8 pennyweights were nuggets. 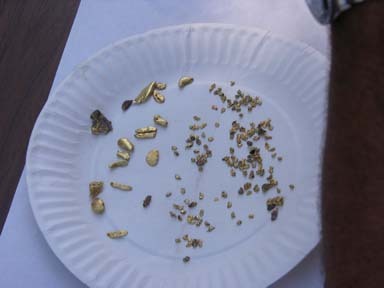 Each participant received 11 gold nuggets (165 nuggets were recovered). Measuring out 14 equal shares was the highlight of the week! Two new pay-streaks were located and developed during the Project. Naturally, since we depart the area once the Project is over, other members were already showing up during the last few days, and another small gold rush was started on the UK claims just as we were leaving. If starting gold rushes were a measurement of how successful a Group Dredging Project is, I’d have to say this was the best Project ever! There were so many members watching us do the final clean-up process on the dredges at the end of the week, that it was difficult to move through the crowd of people! 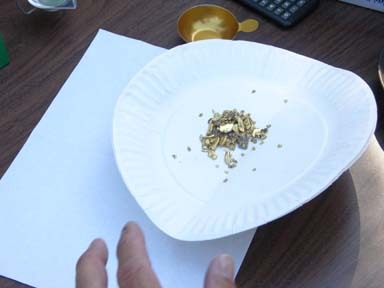 We came close to breaking a record (we recovered around 8 ounces of gold on one earlier Project) in the amount of gold we recovered; and we would have done it, had we just dredged another hour or so in the river. The problem is in not knowing exactly how much gold we have accumulated until we do a full clean-up on the last day. We have one more Group Dredging Project this season scheduled for September 10 through 16. There is still room for a few more participants, if anyone might else be interested in joining us. With the right team, I think we can break the all-time gold record. Does anyone want to guess where we will do the Project?